RealAutoTips. - As we know that there are many motorcycle that using LED for it's light. It is also used in Honda Vario now. As reported from DetikOto, (01/14/2015) that Honda Vario 125 and 150 ESP from the pencahayaanya already use LED Dual Keen Eyes. The presence of this new headlight makes Vario more aggressive and also the lighting so much brighter. 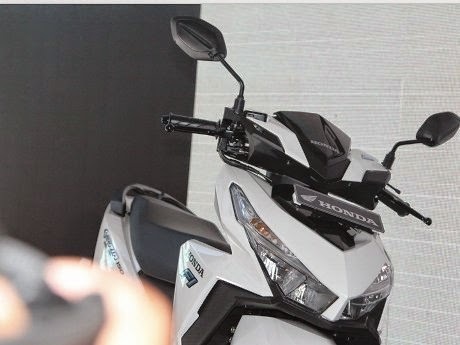 Senior Analysis, Technical Training Development PT Astra Honda Motor (AHM) Sarwono Edhi, said the use of LED lights that will be more efficient than using a light bulb. At 125 and 150 Vario this ESP LED lights have only 2.62 watts for 1 strobes, whereas for high beam only 5.25 watt. Vario while still using the bulb each have 25 watts. Not only that, headlight Vario 125 and 150 ESP is also increasingly characterized thanks to garnish staylish and masculine at the front. With the Dual Keen Eyes Headlight bulbs with LEDs is able to provide a better advantage for the rider through the higher light intensity.